I think this thread is necessary as the number of 1wd knobby-tired lung-burners on the forum has increased. Ogden? Isn't that where you go to have your mountain bike stolen? I don't know about gap jumps. I can't even bunny. TRD270 wrote: Ogden? Isn't that where you go to have your mountain bike stolen? Part of Ogden for sure. Kevin wrote: I don't know about gap jumps. I can't even bunny. You have to run before you can walk. I've never been to the Bike Park in Ogden. I do put in a little bit of time at Corner Canyon in Draper and Lambert Park in Alpine. I lost my crank arm for the second time on the Klondike trails in Moab last weekend. I got it home and cleaned it up really well, it doesn't look damaged so I put it back together and torqued it carefully and I'll give it one more shot before I'll have to spring for a new crank set. Thing is, I really want to go to a 1x drivetrain and I can't afford to do it right now so I'm going to get as much life as I can out of this silly POS. Anybody want to ride Sunday morning? Thinking about Corner Canyon, but whaddeva. I think I'm going to ride there on Thursday. Probably early morning, or maybe after work. Kevin wrote: Anybody want to ride Sunday morning? Thinking about Corner Canyon, but whaddeva. Sometime between "why is it so dark and WhereTF is the damned trail" and "OMG SOMEBODY SAVE ME FROM THE FIERY ORB OF DEATH"? I'm no good Thursday morning, working in Layton at 0800. Josh and I tried to ride Corner Canyon yesterday. Busted my derailleur hanger three miles in. Coasting. On flat trail. Not pedaling, not shifting, not running into rocks. Snap. That's two for two, if something breaks the next I ride with Josh I'm going to start suspecting foul play. On a side note, it's ridiculous how much they want for one of those little hangers. 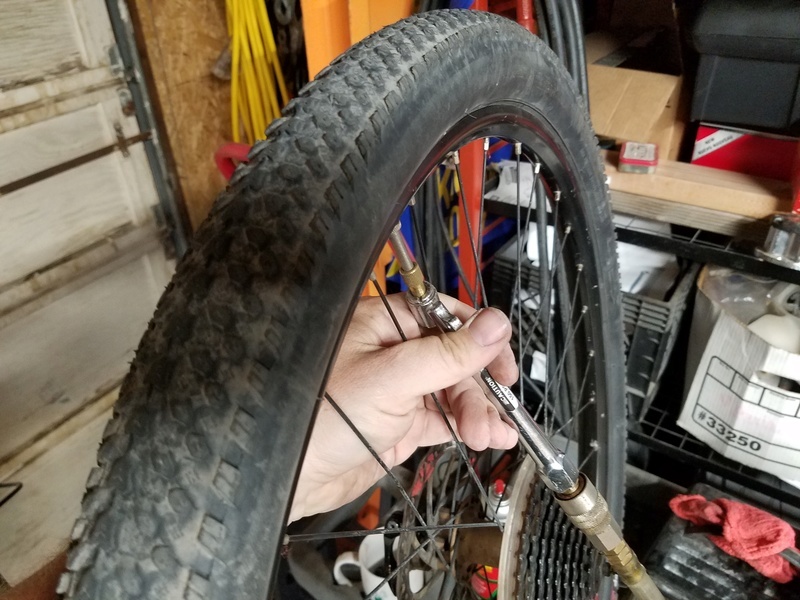 Ghetto tubeless! I've seen it on Youtube so I'm totally an expert. We'll see if it works. Stripped the wheel down, removed the rim strip, cleaned it with degreaser and then brake cleaner. Several companies make replacement liners, but this is ghetto. 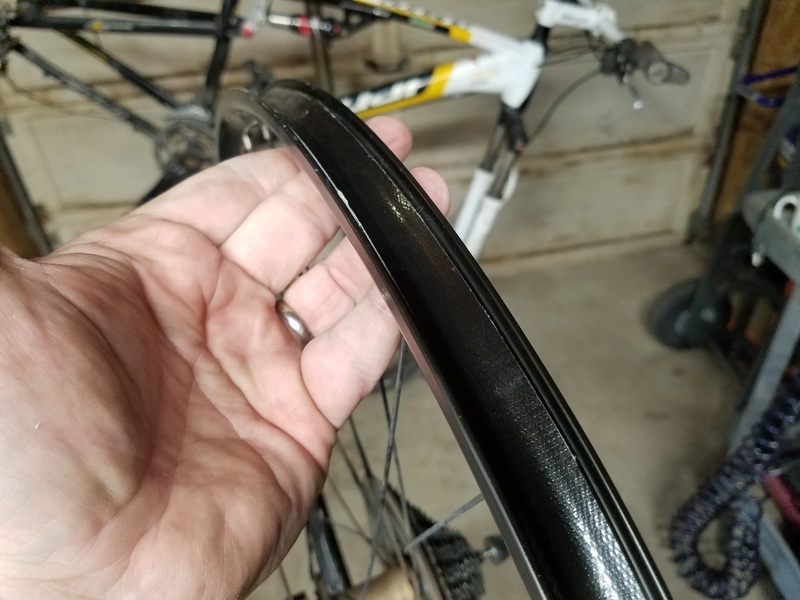 Cut a strip of Gorilla Tape just slightly wider than the inside of the wheel. Pull it on, tight. Tighter. Tighter. Oh baby. Overlap the stem hole by several inches on each side, they say. Press the tape down hard (oh baby) on the edges, make sure it's well seated. Again, you can buy replacement stems specifically for the tubeless conversion. Again, f@$& all that, I don't have time to do this crap right. 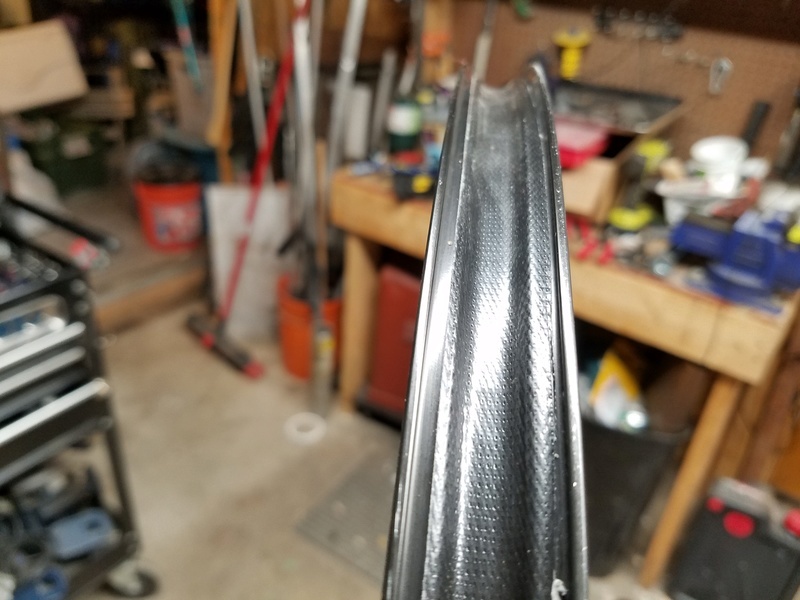 I hacked this stem out of an old tube I got tired of patching. 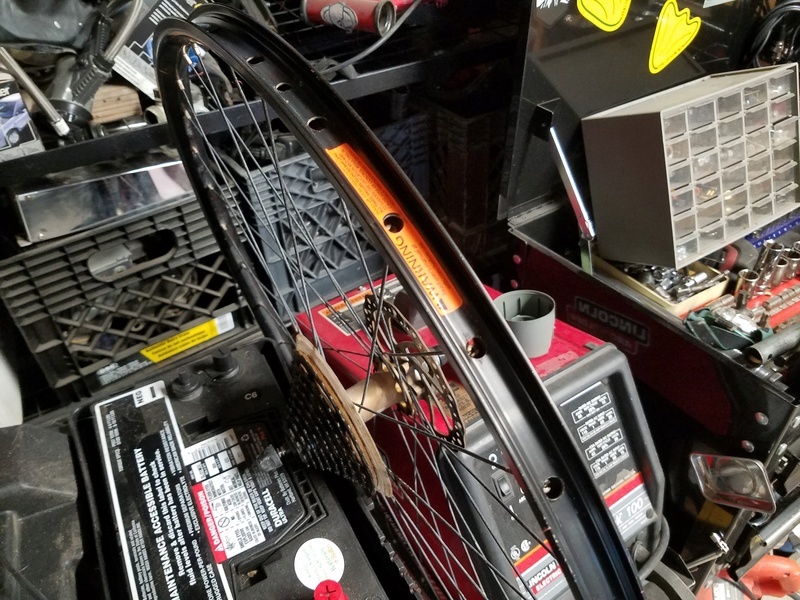 I tried to trim enough rubber that it sits down between the the wheel walls well but leave enough that it has a chance to seal. I may have trimmed too much? One way to find out. Cut an x in the Gorilla Tape just large enough to slip the stem through. And then take a picture of it, because I forgot. Moment of truth, can I seat the bead? Yes, yes I can. I can hear a little air escaping at the stem, but for the most part it's holding. Part two later, I'm still researching exactly which sealant to use. But at least now I know it'll (probably) work. 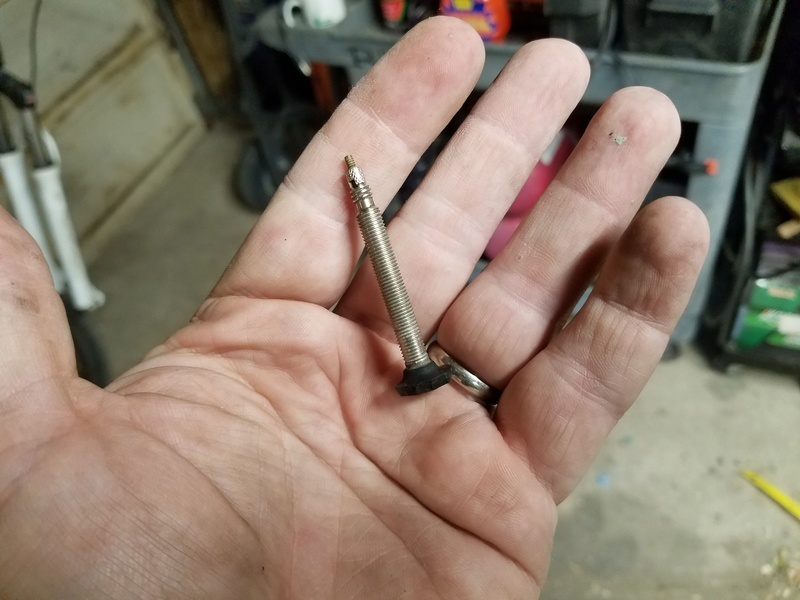 So... if you put a small hole in the tire, will it leak? dutchman wrote: So... if you put a small hole in the tire, will it leak? The sealant stays liquid inside the tire, and theoretically seals any leaks. Advantages are less weight, lower PSI with much less risk of pinch flats. With sealant it should seal and not leak with a small hole. You get your bike fixed Kevin? TRD270 wrote: You get your bike fixed Kevin? Parts are in the mail. I plan to park at the Marina then ride out and back. I really want to canoe the Narrows. Which marina are you starting at? There's one on both ends.